This little refresh of my bathtub area started because I became unhappy with how my bathtub tray/caddy was functioning for me. When we remodeled our master bathroom, I chose a freestanding tub (which I love!! ), but that required me to figure out a way to hold my bath essentials that I like to use while soaking in the tub. This is the bathtub caddy I had been using and it worked well for a little while, but it started to rust and it seemed that I was always having to move it. Bye bye tray!! I shopped for other flat options in wood, etc. to add other texture to this area, but I still ended with the problem of having to move the tray when I want to put my feet up on the end of the bathtub. 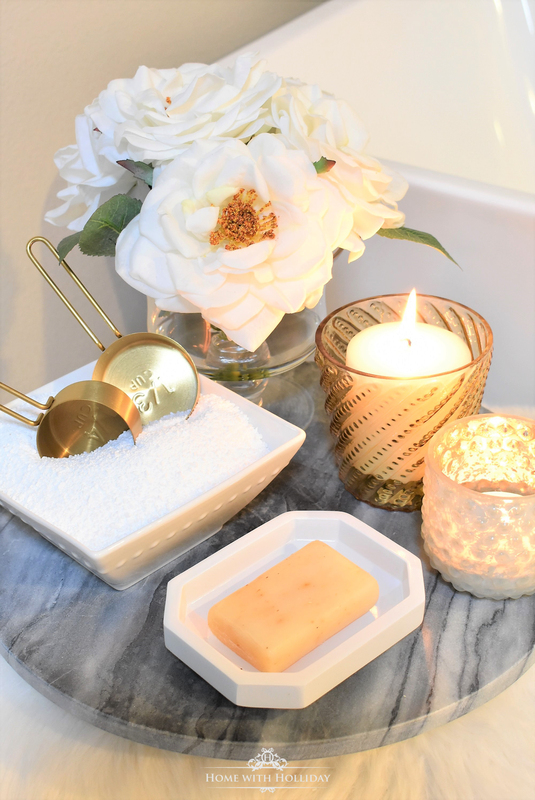 When I started thinking about a replacement for the white bathtub caddy, it dawned on me that I could use a tray on top of my bench that sits by my tub to hold my necessities. And, then a bigger bulb went off in my head…why not find a Lazy Susan that would work?! Bingo! Most of the smaller accessories were bought from HomeGoods, but I shopped similar items to them for you here. The gold hobnail votive holder is from Pottery Barn and I just love it! Click these images to shop the look. A place to rest my favorite soap or bath gel. My Epsom salts…I use them therapeutically in every single bath. (to learn why, see the end of this post). A spot for a cocktail of choice…usually champagne, because it feels extra special! Sometimes, a place to set my phone (only to control the music I want to listen to!). And, of course, something pretty! This bench has always sat by my new tub and I love it! I have used it as a landing spot for my robe and towels. The bench is pretty substantial in size so it provided a decent amount of surface space to handle a reasonable size tray or Lazy Susan. Plus, I love the texture and mixing the metals into my space. Here are a few other options I like for benches you could use to make this work for you in a variety of different styles. When we bought our home 3 years ago (built in 1972), we bought it as a fixer-upper. Our Master Bathroom remodel was a big project that I will share in a post later (we still have a few loose ends to tie up!). Here is a shot of the bathtub area “before”. Needless to say, it needed more than a facelift. That was then…this is now! This is the tub and floor mounted tub filler we used for this project. Both are really well priced. Tips for a healthier bath and a healthier you! Earlier in this post, I talked about the fact that I use Epsom Salts in every bath I take. Several months ago, it was posed to me by a nurse friend of mine that I might have a magnesium deficiency because my calves were cramping. After much research and talking to my doctor, it became clear that I was very deficient! Studies have shown that an estimated 75% of the population have a daily intake of magnesium that is well below normal. There are several things that can contribute to depleting one’s magnesium stores…sodas, caffeine, alcohol, certain medications, etc. I could write a whole post on what I have learned (and probably will at some point)!! To combat my problem, I have attacked it three ways…with supplements, Epsom salts and by applying a topical Magnesium Oil (which provides the quickest, most effective supplementation) once a day. They have all made a huge difference with my muscle cramping, insomnia, anxiety, blood pressure, and fatigue…all naturally. I have tried a lot of products, but these are my favorites. Another way to gain the most personally from your bath time, I would suggest reading another post I just read. A blogger friend of mine, Karen at Sanctuary Home shared a beautiful post this past weekend with Tips for Finding Stillness in a Busy Life. She provides wonderful recommendations to help achieve stillness. I believe that a long, luxurious and quiet hot bath is a great place to achieve stillness and mindfulness and rejuvenate from stressful days. I highly recommend a visit to the post and that you consider following her. She also has mad skills when it comes to making beautiful flower arrangements, among other talents. Win, win! Thank you for stopping by today. Hopefully, some of these ideas will help you create your own oasis of relaxation and respite in your bathroom. It is so important to take care of yourself. Not only can it help you settle and heal your mind and body, but it can also help you be a more relaxed and enlightened person for those you love. You deserve it and so do they. I would love to hear your comments and how you might incorporate some of these ideas into your bathroom spaces. Please consider subscribing to my blog so you can receive instant notices of my new posts! What a fantastic post and such great tips! Love your beautiful bath area and can see why it is your “still place”! Thank you for sharing a link to my blog! I always appreciate you and your support! Have a great evening! Thank you so much, Kathy. I am so happy you stopped by! This is just divine! I love how you thought of every detail. A good bath soak is definitely my happy place. Wonderful post. Never quite been really into bath salts but I think I will give them a try. Definetely go with the lavendar bath salts! Thank you so much for stopping by Jane! Wow! Such an amazing and very inspiring post. Thanks for sharing these beautiful thoughts. Oh, my goodness! How fun! I can’t wait to see what you are doing! !